One of the more consistently popular posts on this blog is this one from 2012, in which I showed the two versions of Charles Spurgeon’s famous illustration that compares the gospel to a lion. In honor of the fact that the Spurgeon Commentary New Testament Letters collection is now compiled and should be on its way to customers soon, I thought I would share another one of Spurgeon’s illustrations that he told multiple times. You have heard, perhaps, of the very pious man, who entered a monastery in order that he might spend all his time in devotion; so, when the time came for the brethren to go into the fields to work, he did not leave his cell; he was too spiritual to handle a hoe or a spade, so he continued in communion with angels. He was very much surprised, however, when the time came for the brotherhood to assemble in the refectory, that he was not called; and after waiting till the demands of hunger overcame the claims of his spiritual being, he went to the prior, and asked why he had not been called to the meal, and he was informed that, as he was so not work, it was thought that he was probably so spiritual that he could not eat; and, at any rate, the laws of the monastery did not permit him to eat until he had earned what he needed. There was much commonsense in that reply. I have no faith in that man’s religion who is lazy. He reminds me always of a certain monk, who went to a monastery, determined to give himself up entirely to contemplation and meditation. When he reached the place, he saw all the monks at work, tilling the ground, ploughing, or trimming the vines round the monastery, so he very solemnly observed as he entered, “Labour not for the meat that perisheth.” The brethren smiled, and they still continued their labours. He thought it his duty to reprove them a second time by saying, “Martha is cumbered with much serving, but I have chosen the good part, which shall not be taken from me.” However, it was taken from him, for the bell did not ring for him at the usual time for meals; and our brother, after waiting some few hours in his cell in prayer, beginning to feel certain calls within, came out, and accosting the prior of the monastery, enquired, “Do not the brethren eat?” “Do you eat?” said he; “I thought you were a spiritual man, for you said to the brethren, ‘Labour not for the meat that perisheth.’ ” “Oh, yes!” he replied, “I know I said that, but I thought the brethren ate.” “Yes,” answered the prior, “so they do, but we have a rule in our monastery that none eat but those that work. There is such a rule to be found in Scripture, too,” he reminded the monk; “Paul himself hath said it, ‘If any man would not work, neither should he eat.’ ” I think the master of that monastery acted and spoke wisely. A man must work in this life. He was sent to this world that he might be diligent in his calling, in the position in life in which God has been pleased to place him. C. H. Spurgeon, Lectures to My Students: The Art of Illustration; Addresses Delivered to the Students of the Pastors’ College, Metropolitan Tabernacle, vol. 3 (London: Passmore & Alabaster, 1905), 44. 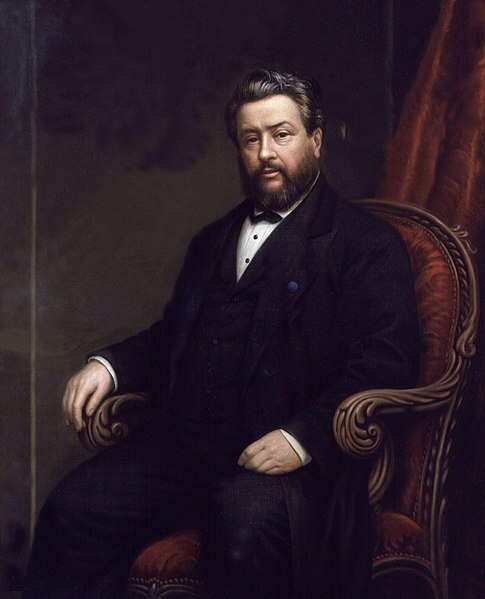 C. H. Spurgeon, The Metropolitan Tabernacle Pulpit Sermons, vol. 52 (London: Passmore & Alabaster, 1906), 62. C. H. Spurgeon, The Metropolitan Tabernacle Pulpit Sermons, vol. 48 (London: Passmore & Alabaster, 1902), 74. The English philosopher John Locke (1632–1704) noted that a preacher “may as well talk Arabic to a poor day-labourer as the notions” that the Anglican clergy preferred as the basis for their sermons. By the same token, Martin Luther’s efforts to provide religious education for the German peasants and urban lower classes failed so completely because the lessons were conceived by a university professor primarily far more concerned with intricate theological nuances than with basic themes…. Luther’s error was not unique. All across Europe, the established churches failed to convert and arouse the “masses,” by failing to recognize that it was a job for preachers, not professors. But the clergy seemed unable to grasp the point that sophisticated sermons on the mysteries of the Trinity neither informed nor converted…. In short: You have to meet people where they are if you want to hold their attention. 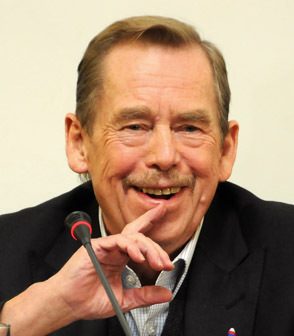 Václav Havel, the playwright and dissident who became president of Czechoslovakia in 1989 and the Czech Republic in 1993, died on Sunday. There are moments when a politician can achieve real political success only by turning aside from the complex network of relativized political considerations, analyses, and calculations, and behaving simply as an honest person. The sudden assertion of human criteria within a dehumanizing framework of political manipulation can be like a flash of lightning illuminating a dark landscape. And truth is suddenly truth again, reason is reason, and honor honor (48–49). I believe that with the loss of God, man has lost a kind of absolute and universal system of coordinates, to which he could always relate anything, chiefly himself. His world and his personality gradually began to break up into separate, incoherent fragments corresponding to different, relative coordinates. And when this happened, man began to lose his inner identity, that is, his identity with himself… It’s as if we were playing for a number of different teams at once, each with different uniforms, and as though–and this is the main thing–we didn’t know which one we ultimately belonged to, which one of those teams was really ours (94–95). Ideology is a specious way of relating to the world. It offers human beings the illusion of an identity, of dignity, and of morality while making it easier for them to part with them (133). If Western young people so often discover that retreat to an Indian monastery fails them as an individual or group solution, then this is obviously because, and only because, it lacks that element of universality, since not everyone can retire to an ashram. Christianity is an example of an opposite way out: it is a point of departure for me here and now–but only because anyone, anywhere, at any time, may avail themselves of it. In other words, the parallel polis points beyond itself and makes sense only as an act of deepening one’s responsibility to and for the whole, as a way of discovering the most appropriate locus for this responsibility, not as an escape from it (195–196). I think that, with respect to the relation of western Europe to the totalitarian systems, no error could be greater than the one looming largest: that of a failure to understand the totalitarian systems for what they ultimately are—a convex mirror of all modern civilization and a harsh, perhaps final call for a global recasting of how that civilization understands itself…. They are, most of all, a convex mirror of the inevitable consequences of rationalism, a grotesquely magnified image of its own deep tendencies, an extreme offshoot of its own expansion (259). It is… becoming evident—and I think that is an experience of an essential and universal importance—that a single, seemingly powerless person who dares to cry out the word of truth and to stand behind it with all his person and all his life, ready to pay a high price, has, surprisingly, greater power, though formally disfranchised, than do thousands of anonymous voters (270). The more an artist compromises to oblige power and gain advantages, the less good art we can expect from him; the more freely and independently, by contrast, he pursues his own vision… the better his chances of creating something good—though it remains only a chance: what is uncompromising need not automatically be good (281). [The totalitarian system] began with an interpretation of history from a single aspect, then made that aspect absolute, and finally reduced all of history to that one aspect. The exciting variety of history was discarded in favor of an orderly, easily understood interplay of “historical laws,” “social groups,” and “relations of production,” so pleasing to the eye of the scientist. But this gradually expelled from history the very thing that gives human life, time, and thus history itself a structure: the story (335). Let us not be mistaken: the best government in the world, the best parliament and the best president, cannot achieve much on their own. And it would also be wrong to expect a general remedy from them only. Freedom and democracy include participation and therefore responsibility from us all (392). I now realize that a public worker should not make statements of which he has not made sure. Above all, a votary of truth must exercise the greatest caution. To allow a man to believe a thing which one has not fully verified is to compromise truth (264-5). Especially during election season, when lies can seem about as plentiful as oxygen, I wonder how much difference it would make if we cared more about telling the truth than we cared about winning, getting our way or spinning things to our advantage. This Lent, I have been reading John Stott’s classic book, The Cross of Christ, to focus on what Jesus’ death means. I found this quote in the last section of the book, called “Living Under the Cross.” In light of the recent conflict between Glenn Beck and Jim Wallis on the meaning of “social justice,” and how it relates to the Gospel, I thought I would share it. … the American Revolution became imbued with a religious cast not because Christians of that era were especially adept at applying Christianity to politics, but because so many people of religious fervor came to consider the political order of as much ultimate concern as the church itself. The same kind of intensity that Jonathan Edwards used in proclaiming the need for repentance and faith, John and Samuel Adams displayed in declaring the need for political liberty. In this sense the American Revolution represents more the product of a residual Christianity, its base deeply eroded, than it does the infusion of genuine Christian principles into politics.